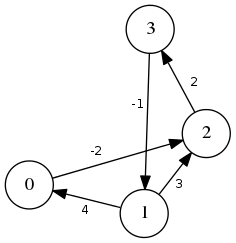 The Floyd-Warshall algorithm calculates the distances between all pairs of vertices in a weighted graph. It is a dynamic programming algorithm very similar to Gauss-Jordan elimination. Below is an implementation in C. The function takes an array of directed arcs, the size of the graph (number of arcs), and its order (number of vertices). It returns a dynamically allocated 2-dimensional array that is the distance table for all pairs of vertices. One thing to notice about the implementation is that when you use INT_MAX to represent infinity, you need to be very careful not to do arithmetic on it that will cause it to roll over and become a small number. This is the reason for the checks for INT_MAX in the main calculation.